On February 25, 1870, Hiram Rhoads Revels—an African Methodist Episcopal, or AME, Church minister—took the oath of office, becoming the first black person to serve in the U.S. Senate. Born free in South Carolina in 1827, Revels was elected to the Mississippi State Senate in 1869 during the Reconstruction Era following the Civil War. The next year the state legislature elected Revels to fill one of two Senate seats left vacant when the state’s senators resigned in 1861 as Mississippi seceded from the Union and joined 10 other southern states to form the Confederacy. Coincidentally, one of those Mississippi senators was Jefferson Davis, who would become president of the Confederacy. Just two days prior to Revels’s swearing-in, Mississippi was readmitted to the Union. Tomorrow is the 142nd anniversary of Revels’s swearing-in ceremony, and it provides the perfect opportunity to reflect on the obstacles African Americans have encountered—and continue to encounter—in exercising their right to vote and to participate in the political process. The Center for American Progress and many other progressive organizations have been outspoken in condemning conservative lawmakers who are introducing and passing legislation that creates new barriers for those registering to vote, shortens the early voting period, and imposes new rules for already-registered voters, including requiring individuals to produce a government-issued photo ID before being allowed to vote. All of these measures have the potential to disenfranchise millions of Americans, particularly communities of color, students, and seniors. Antivoting legislation has caught fire across our country. In 2011 lawmakers in more than 30 states introduced legislation making it harder to vote, with more than a dozen states passing these bills into law. And in the run-up to the 2012 elections, voter suppression legislation is continuing to be advanced. Today, 142 years after the 1870 ratification of the 15th Amendment—which forbade the denial of the right to vote based on race, color, or previous condition of servitude—African Americans and people of color find themselves facing a growing number of impediments to the ballot box. Since the founding of the United States, the right of its African American citizens to vote has been continually under attack. In the early years of the nation, slaves, who were seen as no more than chattel, were disenfranchised. The cause of African American suffrage is rooted in the birth of this nation when 10 of the 13 original colonies—the holdouts being Georgia, Virginia, and South Carolina—allowed free black men to vote. That situation, however, would soon change but not for the better. From the 1790s through the first half of the 19th century, free blacks would be systematically stripped of their right to vote through a series of laws and state constitutional amendments—so much so that by 1850 blacks would be ineligible to vote in 25 of the country’s 31 states. Only Massachusetts, Maine, New Hampshire, Rhode Island, and Vermont allowed blacks free and unfettered access to the ballot box, although fewer than 4 percent of the country’s blacks resided in those states. The sixth state, New York, also gave its African American male citizens the vote but established onerous property ownership and residency requirements that made it all but impossible for them to actually do so. The Civil War, which ripped apart the nation and cost more than 620,000 lives, ushered in the 13th Amendment abolishing slavery, the 14th Amendment making all people born or naturalized in the United States citizens, and the 15th Amendment extending voting rights to the former slaves. A short-lived 12-year period (1865 to 1877) immediately following the Civil War, known as Reconstruction, saw black men for the first time voting in large numbers and being elected to office, including Revels, much to the consternation of many white Americans in both the South and the North. The backlash to blacks voting unleashed widespread violence throughout the South and gave rise to terror groups such as the Ku Klux Klan and the White League. As the former Confederate states were welcomed back into the Union and whites returned to power in the South, Jim Crow laws were enacted that stripped away all manner of rights, including voting rights, from blacks and returned them to a state of servitude little better than slavery. It would be another 28 years before another African American would serve in Congress and not until 1972—following the agitation of the Civil Rights movement and the passage of the Voting Rights Act of 1965—that a black person would be elected to Congress from the South. As was the case during Reconstruction, the less progressive members of our citizenry are scared of the collective impact of black voters. Adding to their concern going into the 2012 elections is the growing number of young and Hispanic voters who are strongly progressive. In 2008 both groups delivered two-thirds of their votes to President Barack Obama, while 95 percent of African American voters went for the president. That is why conservatives, backed by corporate donors, are resorting to extreme measures to suppress the votes of the young and minorities. Just as poll taxes and impossibly skewed literacy tests were used to bar blacks from voting during the Jim Crow era, the raft of voter suppression laws now being advanced have a singular and equally despicable aim—the disenfranchisement of targeted groups of voters. 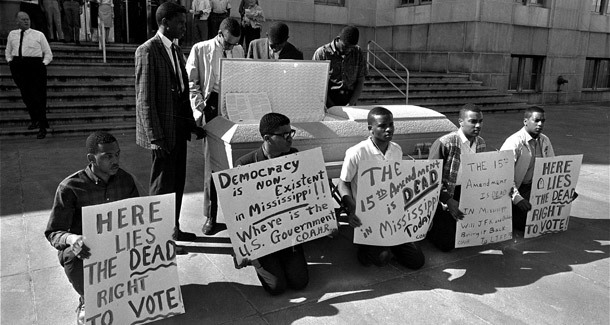 As we reflect on the long struggle for voting rights on this red-letter day in black history, let’s recommit ourselves to protecting the vote in America. To do less is to undermine our democracy. Carl Chancellor is the Senior Editor at the Center for American Progress.